To cut Iberico Ham has become a ritual, and those who have mastered it travel the world delighting diners and expectant tasters. 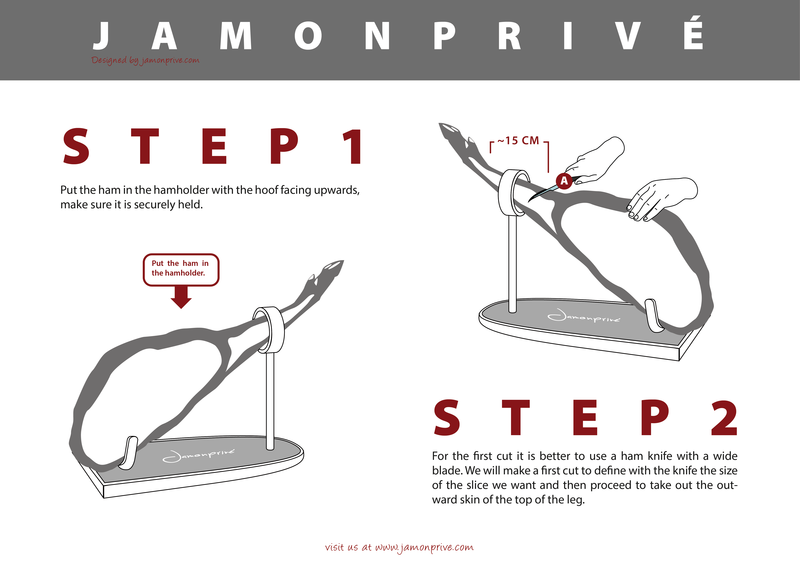 To cut an Iberico ham and fillet an Iberico ham there are a series of steps to follow and essential tools that are needed. The first item needed is a good base to place the leg of the Spanish ham and safely work. In the market there are many models available. However, it is important to select one that will support and secure the Spanish ham adequately from the hip area to the hoof. A - Broad blade knife: a short blade, but wide, robust and very sharp. It is used to make cuts in the ham hock area, and also to peel and remove the most superficial fat before beginning to slice. C - Boning knife: blade is very short, narrow but robust and sharp. It is used to make clean cuts in areas of the ham that are complicated, especially zones that are close the bones. * - Knife sharpener: A knife steel, used to sharpen all types of knives. Most knives are sharpened with a sharpening stone, however in the case of the jamonero knife it is recommended to use a knife sharpener. The knife sharpener must remain still during sharpening, letting the knife do the fluid movement along the length and width of the blade. Start sharpening by placing the part of the blade closest to the handle onto the tip of the sharpener, then proceed to lowering progressively to the handle of the sharpener. Once one side of the blade is done, clean the knife sharpener and do the same on the other side. Before placing the jam on the base you have to think about the number of slices to be cut. If you will be consuming the entire ham start by trimming at the hoof. If it is going to take several weeks to consume, place the Spanish ham upside down and remove the first slices from the hock area. The ham should be placed on the base at the most comfortable height for the one processing and cutting it. Once the Spanish ham is placed, you must peel the area where the slices will be removed from. Then continue to remove the yellow skin and fat along with any mold that has appeared during the curing and drying process. It is advisable to only strip the area to be consumed to prevent the rest of the Spanish ham from drying and losing its properties. Now you can start to slice the Iberico ham. After peeling the area to be sliced, it is recommended the slices to be around 6 cm. To do this, slide the knife from the hoof towards the hip, trying to cover the entire surface. Make cuts parallel cuts by keeping the knife as flat as possible. The meat slices that come from the hip and lower part of the ham hock tend to be less juicy. It is strongly recommended to combine these slices with other slices that are juicy and with infiltrated fat. To remove sliced from the hip it is necessary to use the smallest knife and make vertical cuts to allow easier meat extraction. Once all the slicing is completed, there can be pieces of meat stuck to the bone that can be removed. These pieces can be used to make delicious tacos. When finished with one side of the ham, turn the Spanish ham over and continue the same procedure elsewhere on the ham. When all the meat has been sliced, including the parts directly stuck to the bone, you can use a saw to cut the bones and use them to add flavor and aroma to soups or make a bone broth. 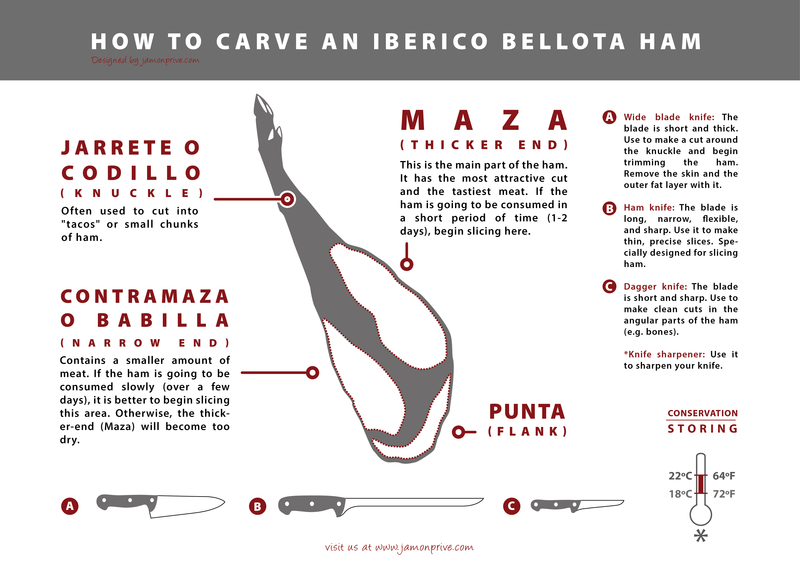 To cut an Iberico shoulder one must follow the same steps as to cutting Iberico ham, and take into account the same principles that apply to Iberico ham. The only difference is the location of the bones in the shoulder and the need to use knives that are shorter and more rigid to be able to reach the shank area, which is one of the juiciest areas in the Iberico shoulder.